1. Almond flour causes us to overeat almonds. When we puree, grind, juice, dry, or cook our food, we definitely change its volume and often its water and fiber content as well. It certainly would be easier to avoid overeating if we only ate whole, raw foods but most of us are simply not going to do that. In fact, the best way to lose weight may well be to make our food bland and unpalatable, but we are not going to do that, at least not on purpose. Instead, we avoid eating excessive quantities by always eating proportionately, the TQI way. Even our breakfast muffin is best eaten with some fresh fruit, despite having an equal amount of cooked and/or pureed banana and sweet potato. On occasion, an almond waffle or pancake likely will provide more almonds than we might eat in raw form. But, given that we always eat almonds (in whatever form) with plenty of fruits and vegetables, we simply need not worry about overeating almonds when we use almond flour. Almost all nuts are higher in omega-6s than omega-3s, and this could create an inflammatory imbalance. That is one of the main reasons why we never eat nuts without a proportionate amount of fruits and vegetables, emphasizing berries and leafy greens. Many nutritious and satisfying foods do not have a “perfect” 6:3 ratio but that does not mean they do not have other important benefits. Nuts promote heart health, they are a good source of minerals, and most people really enjoy them. Rather than limit or avoid nuts, we simply eat them proportionately while making sure that our overall diet has a good balance of omega 3 foods. When we heat animal products, their saturated cholesterol is oxidized into oxysterols. Oxysterols are found in atherosclerotic plaque and some say that while cholesterol is not a problem for heart health, oxysterols are. Unsaturated plant fats are much less heat stable than saturated fats. Heat will oxidize them into POPs that theoretically might also play a role in atherosclerosis. But when we heat plant foods, as distinct from isolated plant oils, they do not form many POPs and those formed are not well absorbed. As a result, POPs are not considered to be much of a problem. Moreover, flax, a seed very high in heat fragile omega 3s, when used in whole, ground form is quite heat stable and increases omega 3 blood levels. Similarly, the omega 3s in fish and walnuts are not much damaged in cooking. In contrast, flax or fish oil should not be heated because the protective compounds have been lost in the extraction process. All plant foods provide fats that in a test tube are not heat stable but that does not mean that we must eat these foods only in raw form. Almonds (and many other foods) contain oxalates and phytates, often referred to as anti-nutrients. Oxalates can precipitate as kidney stones and many “stone formers” are put on a preventative low oxalate diet that eliminates spinach, rhubarb, nuts and seeds, potatoes and yams, legumes, chocolate, most grains, and, as well, cinnamon and turmeric supplements. Most find this a tough diet to follow. Other researchers reason that kidney stones usually result when people are dehydrated and eating too much dairy, fish, meat, and too many fructose-containing foods. Some studies suggest that the amounts of oxalates absorbed when eaten as part of a healthy diet are too small to cause the amount of urinary oxalates in stone formers. Other studies show that as we eat more oxalates, we host more oxalate-metabolizing microbes that in turn prevent us from absorbing those oxalates. As well, both phytates and oxalates have the ability to bind to essential minerals, raising the concern that eating foods rich in them, such as almonds, will lead to mineral deficiency. Studies, however, are clear that, if part of a healthy diet, both phytates and oxalates enhance the growth of beneficial microbes that prevent those negative effects. In addition, phytates have some cancer preventing properties and should not be viewed as strictly anti-nutrient. Finally, the author suggests that we use coconut flour instead of almond flour. Her main argument is that saturated coconut fats are more heat stable. As mentioned above, heat stability is not an issue when using almond flour. Personally, I often find coconut flour too drying to easily substitute for other flours. Ultimately, when it comes to almonds, if they agree with you and you like them, eat them – even in the form of almond flour. But be sure to do so in the context of a proportionate diet rich in leafy greens and berries. 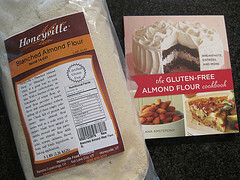 The blog discussed is (http://empoweredsustenance.com/avoid-almond-flour/). NOTE: You are welcome to use my blog’s original images and content for non-commercial purposes but only if you attribute the work to me (Kathy Abascal) and link back to the blog. This work is licensed under a Creative Commons Attribution-Noncommercial 3.0 United States License. This entry was posted in Food and tagged almond flour, anti-nutrients, atherosclerosis, coconut flour, food, kidney stones, omega 6s, omega-3s, overeating, oxalates, oxysterols, phytates, phytosterols, POPs, saturated fats. Bookmark the permalink. 12 Responses to Is Almond Flour Trouble? Almond meal is another way of saying finely ground almonds or almond flour. If you have trouble with calcium oxalate kidney stones be aware that any nut in any form will only increase your chance of more kidney stones. Almond flour in my case caused severe pain and kidney stones. I did not have this problem prior to using nut flours. As mentioned: Some scientists recommend avoiding oxalate-rich foods in those who have formed a calcium oxalate kidney stone. Nuts are one of, but not the only, oxalate-rich foods. Eat enough rhubarb, soy, sweet potatoes, etc. and you can consume as many oxalates as if you were using nut flour. Other scientists think animal protein and dehydration is a much more likely trigger. Virtually all appear to agree that animal protein in excess (especially dairy & fish) and dehydration contribute to stone formation. Some think oxalates can be balanced by taking 1000 mg or more of calcium. Other studies show that 1000 mg or more of calcium supplements actually increases the incidence of kidney stones. Given that stones can form slowly over time, it is very difficult to give unassailable advice on how to avoid future kidney stones in those who have formed one. There appears to be a consensus, however, that those who have never formed a kidney stone need not go on an oxalate-reduced diet. Where do scientists publish these sorts of findings? Would love to read more! Mostly this type of information is published in medical and/or scientific journals. You can use a database such as Pubmed to find articles and can read abstracts of those studies on line. To really get the full picture though you need to read the full article. You would do that at a University library unless you have online access to the literature through an institution. Thank you for continuously educating us Kathy. Is there a risk of developing sensitivities to almonds through using them too much? For example, a breakfast muffin in the morning, fruit with nut butter later, nut loaf at dinner? That really depends on the health of your intestinal tract. If you are inflamed and eat a food frequently, you increase the odds of developing a sensitivity. Eat a healthy food while health (and eating proportionately), and that food will not become a problem. So, a good way to tell: Does the food feel good & healthy to you in the quantity you are eating? We cook with both almond flour and coconut flour, though use the almond flour more frequently. Coconut flour absorbs substantially more water/fluid than other flours, including almond flour. It also has a strong flavor, which you may or may not want in what you’re making. The main trick is to *not* simply substitute coconut flour for another flour on a one-to-one basis. That is a recipe for disaster. Often you only need about 1/4 the amount of coconut flour that you would for other flours. The best thing to do is find recipes that have already been tested so that the ratios are correct. Coconut flour does have a very specific taste. It’s nice for muffins sometimes if you specifically want that coconut flavor. I also use it (in limited amounts) in things like quinoa/egg burgers, because it is so good at absorbing liquid and binding things together. You just have to be careful not to use too much–unless you goal is to have a coconut-flavor to your patties, which admittedly *is* sometimes nice!